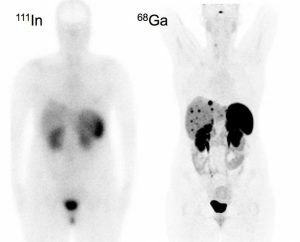 A few days ago, I had a scan for cancer called a GA-68 or gallium-68 or Netspot. This was designed specifically to detect neuroendocrine tumors. My own results are reported here: The Results of my GA-68 Scan. Northern California CarciNET: searchable map! I figure it might help other people with NETS to explain what this scan is. 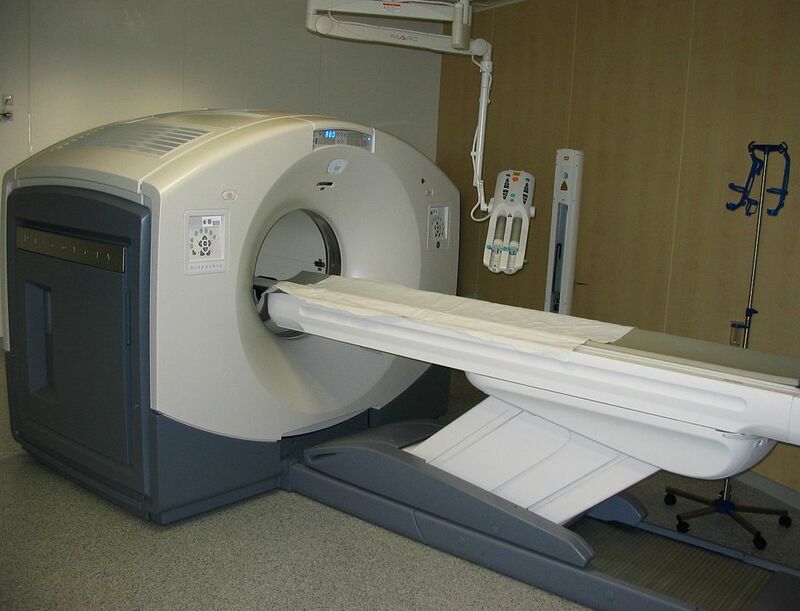 If you have had a cancer or know people with cancer, you probably know that a PET (Positron Emission Tomography) scan is used to try to locate tumors and metastases. The traditional PET scans normally do not work with neuroendocrine tumors because the biology of the tumor is different than most cancers so the standard markers do not function. One year ago, the FDA approved a different kind of marker for use with PET scanners that is specifically designed for neuroendocrine tumor. The GA-68 (commercial name: Netspot) is an injectable that is a binding of radioactive gallium 68 to a somatostatin analog called octreotate. Neuroendocrine tumors have receptors for the hormone somatostatin in over 60% of patients. 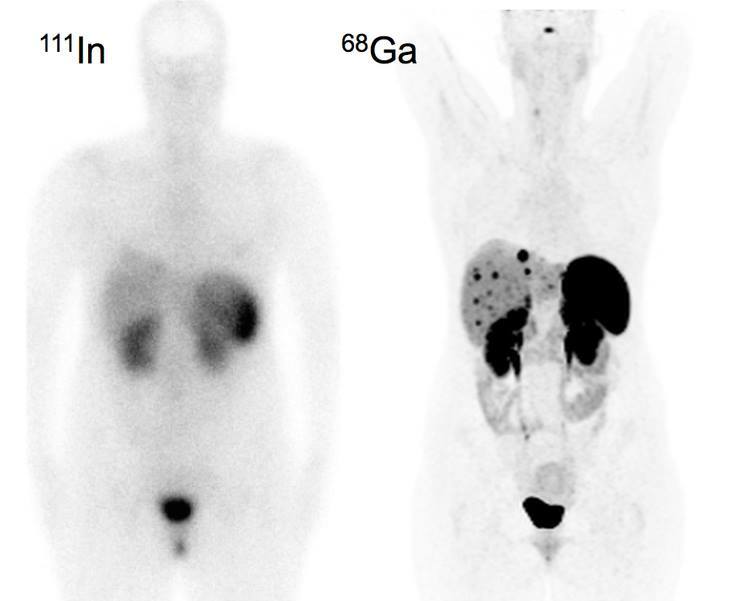 The tumors therefore will capture the somatostatin as it passes by and of course the radioactive GA-68 bound with it. Although some other tumor types and even some body parts (pituitary gland for instance) have receptors, if you are the lucky patient whose tumors have these receptors, you can get a good picture of where the tumors are by tracking the radiation. The PET cameras take pictures of the radiation in the body. GA-68 scans have been used in Europe for over 15 years already. Apparently, they were not considered profitable enough to develop, test, and get approval for in the U.S. until recently. You are probably familiar with CT (xray Computed Tomography) scans. These take three dimensional xrays of the body. The new PET machines are actually PET/CT machines. They take the PET and the CT at the same time. Before now the best we had for neuroendocrine tumors were CT scans, MRIs, and octreoscans which were a much weaker version of the GA-68 type of scan without the attached CT scan. After my diagnosis, I have had more than six octreoscans (about one per year) and a CT scan every six months and one or two MRIs. This picture shows the difference between the GA-68 and the octreoscan. What a difference. The black dots are areas of high “uptake” meaning attachment to the marker. My first radiologist showed me my first octreoscan and said “‘nuclear medicine’ is sometimes called ‘unclear medicine’!” These are not my scans. They were uploaded to Facebook for an example. Combining the CT scan and the Netspot PET scan in one picture is even more powerful. The gallium radiation has a very short life. We patients are given no warnings at all except to drink lots of water so the radiation won’t gather in the kidneys. NOTE: Although the gallium injectable is more radioactive than the indium-111 used in the octreoscan, the patient actually receives less radiation because the gallium-68 isotope has a much shorter life than the indium-111 isotope. The old octreoscan routine was to wait until the end of my 28 day Sandostatin injection cycle then I had to take a laxative the night before and fast until I was given the injection. After the injection we waited 4 hours, then had about an hour laying flat on my back without moving in the nuclear scanner. The hour long scan was repeated the next day and sometimes even a third and fourth day. I was warned that I would need a doctor’s letter to pass through an airport within 30 days of the injection. What a pain! The Netspot PET/CT requires no preparation, no laxative, no fasting. It could be given 15 days after the last Sandostatin injection and they asked that you not use an octreotide “rescue” injection for a day. You are given the injection, wait an hour, then climb onto the scanner bed pictured above and lay still for less than 40 minutes. That’s it! Unlike a normal CT scan there are no breathing instructions during the scan (“hold your breath”, “breathe”). The machine is a bit bigger than a CT scan but is open on both ends so there is no claustrophobia. Edit: 2017-06-05 Like NETs patients, each medical facility is different. My scan was at Rocky Mountain Cancer Center where Dr. Liu works. Someone just told me that a facility in Arizona is telling patients that they must wait 4 to 6 weeks after their Sandostatin injection to get a Netspot scan. Also note that Medicare is paying for these scans but how much is paid and the difficulty of getting approval may depend on your add-on plans. As far as all health insurances, I have heard that the scan part is usually covered (perhaps around $1,000). But the Netspot injection is separate and is much more expensive. That is the part insurance companies are unsure about. Additionally, of course, each medical facility may charge differently for the scans. SNNMI NETSPOT™ (gallium Ga 68 dotatate) Reader Training A pdf on how to read the scans. I am not a doctor or medical person (perhaps a professional patient these days). The above is my “not a doctor” explanation of some very complex things. I hope that it helps and is not incorrect in any substantive way.